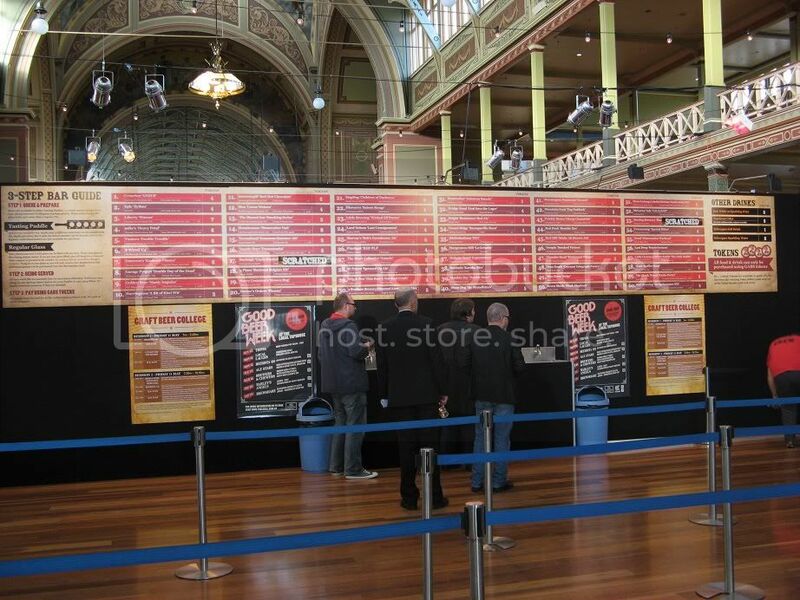 The Great Australasian Beer SpecTAPular is the first event in this year's Good Beer Week. The Local Tap House approached 60 breweries in Australia and New Zealand to brew a special and unique beer for the festival. Those beers were then presented to the public over 3 days and 5 sessions. 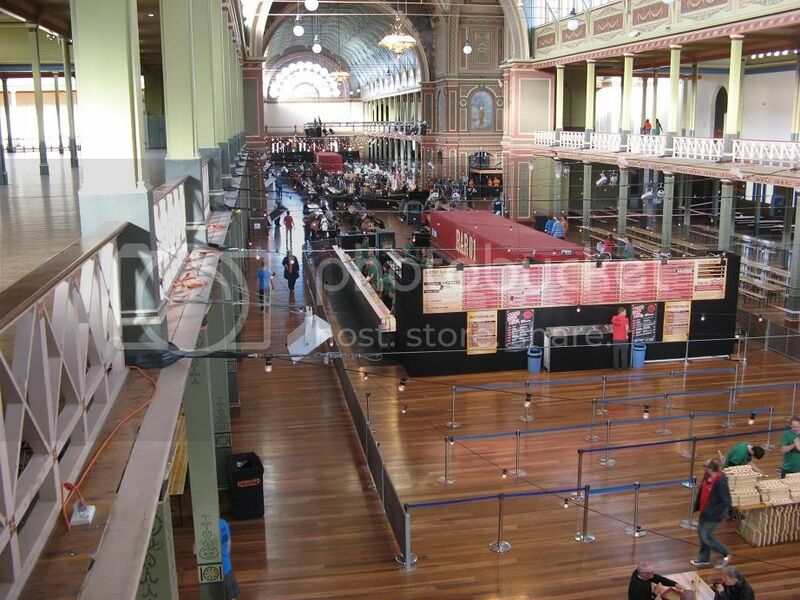 The photo below was taken late on Friday night when it was not busy (photo taken from the VIP lounge), during the Saturday afternoon session, the queue started at the bar and wound its way virtually back to the front door (back in the middle of the photo). The event featured two large containers at each end of the hall, with two bars on each side - all bars pour the same 60 beers. A central stage with band and entertainment, various tables through the hall, food vendors off to the right (out of photo) and the 'Craft Beer College' at the far left of this shot (upstairs exactly opposite of where this photo was taken from). 58 beers, some cider, wine and softdrink. The beer list is shown below, with more info here, and in the guidebook (click link to download). Some very interesting and unusual beers, gruit, grisette and other concoctions and many other decent craft beers (IPA's, Belgians, porters, stouts, wheat beers etc), most all of which are new and unique to the festival - some made for the first time just for this event. While the usual-stuff was good, it was the unique and one-off beers, that I've never had before (and may never again) that made the event much more interesting and enjoyable. Some of those unique beers were not my thing (too much chilli, too much funk etc) but I was pleasantly surprised at how interestingly good some of the one-off beers were (rose petals, EarlGrey tea, coconut, Christmas-tree, chocolate, karaka fruit, watermelon). 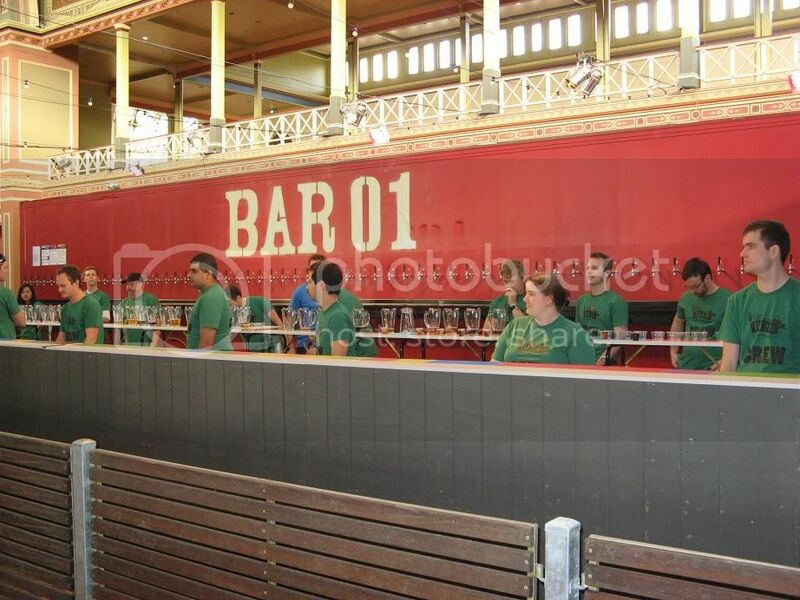 The 4 bars is where it all happens (see photo below) 60 beer taps lined up on either side of a refrigerated container. The procedure for most people is to grab their wooden tasting paddle, write on it (in chalk) which beers they'd like to sample, and then take it to the bar-attendants who will add the beer to the paddle, however individual glasses of a specific beer can also be purchased. I was there on Friday and Saturday, first as a volunteer (helping keep the VIP bar stocked) and then as a punter. The good thing about visiting on both days was that I had a chance to try each of the 58 beers on offer. The unusual beers - even if I did not always like them - were well worth trying but I did find myself going back for another glass of beer #51 a 'Double Dubbel IPA'.